There's no cause and effect with these showrunners. No ripple effect. Nothing says drama like two sisters cat-fighting. *eyeroll* Another appalling fan-fic episode. Nice visuals, though. 2/10 Impressive visuals. Nauseating fan-service writing and scenarios, and heavy on the 'Game of Bros' that is the showrunner's signature style. Male/Female ratio of interesting things to do and say leaning heavy 80/20%, with Dany having 15 of that 20. Completely ridiculous concept of travel. What's really ticking me off this Season is the obvious "Game of Bros" feel. Female characters are expendable. Olenna, the Sand Snakes, Ellaria...all gone. Even Mel is out of the picture after 2 lackluster appearances. Yara, captured and subdued. That's 7 women snuffed out of the story in two episodes. Oh wait, they dismissed Meera, too. 8 women. But the Bros live on! Jaime sinks in full plate metal. It's ok, Bronn saves him (and Bronn should have been melted by the dragon. He's useless as a character.) And now we have Beric, the Hound, teaming up with Gendry (why is he back?) and Jorah. Game of Bros!!!! Game ON, Duuuuuuuude! This Season is one giant sausage fest written by aging frat boys. 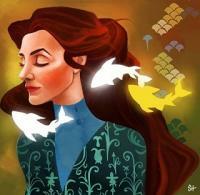 Catelyn in the books is a major character. In the shows she is a lesser supporting character. Look at Fairley's screentime over her three years. Less than Eddard's total screentime for one season. It's clear the showrunners were not particularly enamored with the character--so there was never any chance for LSH. Correct. This was her season to be if it were to happen, and after episode 8, it was not to happen! I do think D&D should make reference that LSH is cut, at this point. That would be the decent thing to do. But it's D&D, so....that won't happen. I think expecting LSH at this point is akin to insanity. D and D were clearly uninterested. R.I.P. Lady Stoneheart. It's been fun waiting for her, guys. Too bad D&D are hack douches. I forget which movie it is from, but it is Fairley in another film. A poster on reddit put an end to that spoiler. The good thing is, we'll know for sure this Sunday. If the Hound is making his way to the brotherhood, she has to be there or no game. If Thoros is there and if he proclaims himself as the leader--no game. We'll know Sunday. Yes. Cat's Uncle made reference to it. The amount of references to Cat's death are quite high in the show--verbally and in flashbacks. I believe Brienne is speaking to Jaime in the preview for next episode. She is also speaking with the Blackfish, so she gets at least two scenes. My God, you're right. There has been some amazing character assassinations for the Starks!